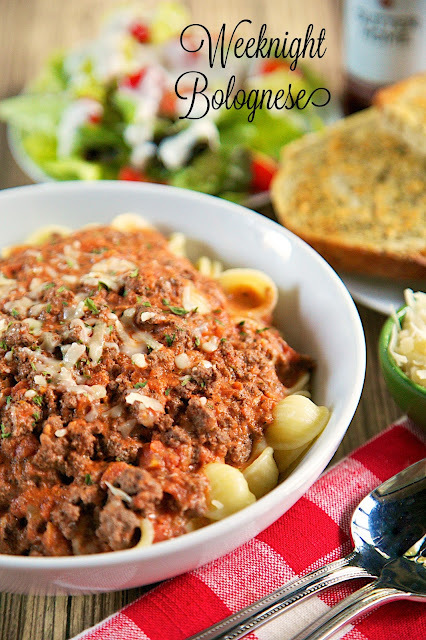 Weeknight Bolognese - from scratch bolognese sauce made in under 30 minutes! Beef, garlic, seasonings, tomatoes, tomato paste, red wine, cream and parmesan. Tastes like it has simmered on the stove all day. This has quickly become one of our favorite meals! 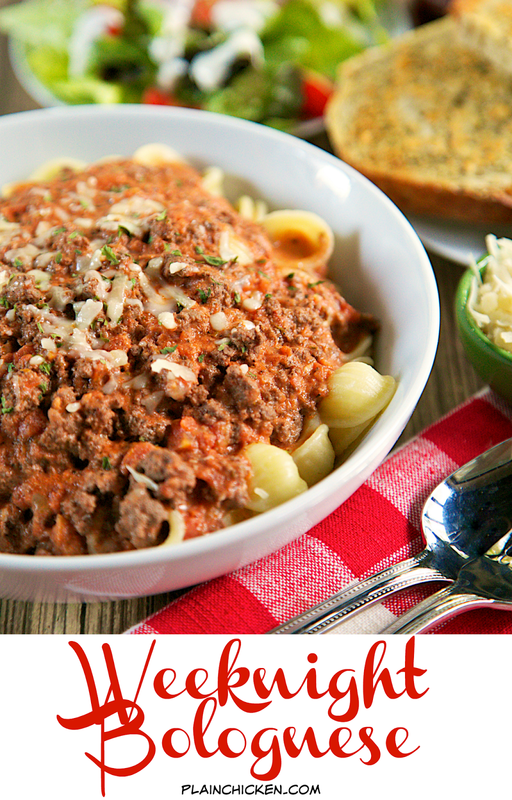 This Weeknight Bolognese is AMAZING and only takes about 30 minutes! I made this for the first time about a month ago. It was so good that I've made it several more times since then. 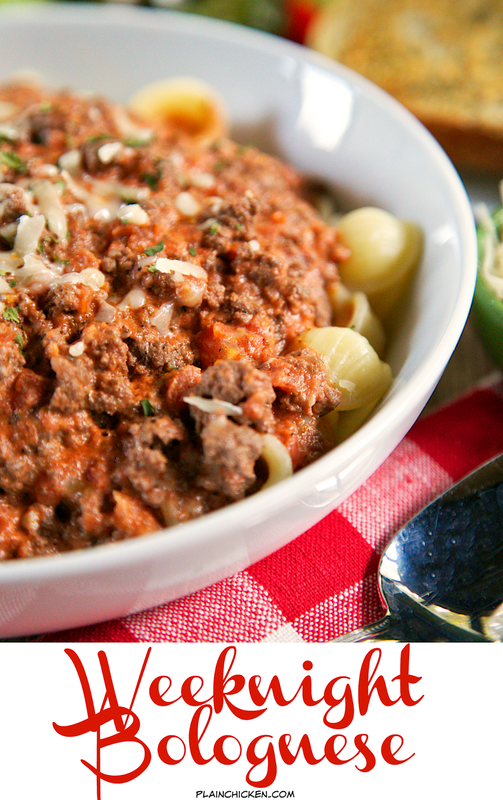 It has quickly become one of our favorite meals! 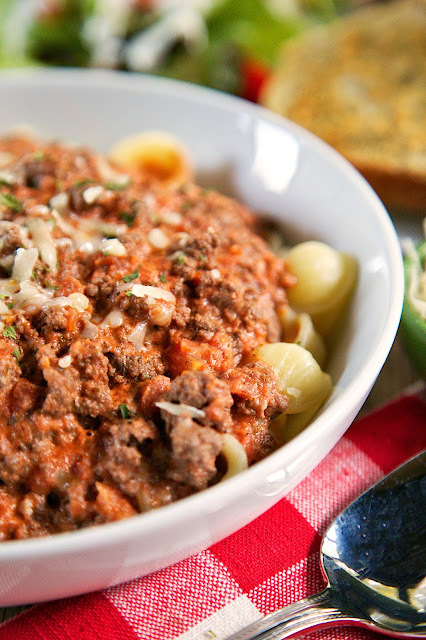 This recipe starts with cooking some lean ground beef. Next you add some seasonings, crushed tomatoes (I recommend San Marzano tomatoes), a bit of tomato paste and some red wine. Let that simmer and finish the sauce off with some heavy cream and parmesan cheese. The sauce tastes SO good! It tastes like it has simmered all day, but it only cooked for about 20 minutes. You can't beat that! We served the sauce over some orecchiette, but feel free to use your favorite noodle. The sauce and pasta reheats well. I ate this a couple of days for lunch and it was equally delicious! You can also make the sauce and freeze it for later. In a Dutch Oven over medium-high heat, cook the ground beef. Drain fat. Add garlic to pan and cook for one minute. Add oregano, onion powder, red pepper, red wine, tomatoes, tomato paste, sugar, salt and pepper. Bring to a boil; reduce heat and simmer 10 minutes. Add cream and parmesan cheese. Cook additional 10 minutes. Toss with pasta.